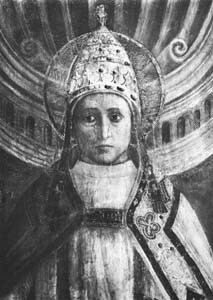 Pope Saint Zephyrinus was pope from 199 to 217. He was a Roman citizen by birth who reigned as the head bishop of Rome for close to 20 years, after being elected to the papacy upon the death of the previous pope, Victor I. Much of our information about Zephyrinus comes from his rival and critic, Hippolytus of Rome, who portrays him as uneducated, vacillating, and subject to bribery, relying on the bad advice of his adviser Callixtus, and not forceful enough in dealing with heresy. A more sympathetic view might see him as a conciliator who, as pope, adopted a parental attitude toward his squabbling children rather than taking one side or the other. The theological conflict on which Hippolytus took Zephyrinus to task dealt with the questions of the Trinity and the Incarnation: did only one "person" of the Trinity show himself as Jesus Christ, or did God as a divine unity manifest himself in Jesus? Zephyrinus was also criticized by Hippolytus for too easily receiving back into communion certain lapsed Christians who had committed serious offenses. During his long papacy, the fortunes of the Roman Church in relation to the state at first worsened when Emperor Septimus Severus turned hostile, but began to improve under Caracalla. Zephyrinus was succeeded, upon his death on December 20, 217, by his principal adviser, Callixtus. This led to Hippolytus forming a schismatic group with himself as antipope, although he was later reconciled to the Church and named a saint. Two decrees are attributed to Zephyrinus, one declaring that lapsed Christians may be forgiven of their sin after due penance, the other stipulating that the age of first communion should be no less than 14 years. 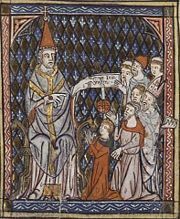 The feast of Pope Saint Zephyrinus, formerly held on August 26, is now celebrated on December 20. Septimius Severus, who at first tolerated Christianity, but later banned conversions to the faith. After the death of Pope Victor I in 198, Zephyrinus was elected his successor and consecrated as pope. He is described by Hippolytus (Philosophymena IX, xi) as a simple man without education. Although Hippolytus was hardly an objective reporter, it may be true that Zephyrinus had not engaged in higher theological studies, but devoted himself instead to the practical administration of the Church throughout his career as a churchman. Immediately after his elevation to the Roman See, Zephyrinus called to Rome the confessor Callixtus, who had been freed from servitude in the mines under Pope Victor's administration. Zephyrinus placed Callixtus in charge of the Christian cemetery on the Via Appia which now bears his name. He closely advised Zephyrinus as his deacon, and Callixtus' influence over the pope would soon become a bone of contention in Zephyrinus' troubles, particularly with Hippolytus. Meanwhile, the position of the Christians, which had remained favorable in the first years of the government of Emperor Septimus Severus (193-211), grew constantly worse. Some of this was tied to the fact that three years into Zephyrinus' episcopacy, Septimius held a celebration to mark his tenth anniversary as emperor, which prominent Christians generally boycotted due to its pagan character. The bitter infighting among Christians, as well as their intolerance toward pagans, may also have played a role in Septimus' change of heart. In any case, as part of an effort to create a more unified Roman culture, Septimus issued an edict in 202 or 203 which forbade conversion to Christianity under the severest penalties. However, nothing is known specifically about the execution of the edict in Rome, nor of any martyrs of the Roman Church in this era. Internally, during Zephyrinus' long reign, serious disputes arose within the Roman Church. The Montanists were especially active in Rome during this period, and the Novatianist schism was also still alive. Moreover, the Adoptionist movement originally led by Theodutus the Tanner grew in statue. Zephyrinus's greatest problem, however came in the form of a conflict over the doctrine of the Trinity in which his inaction led to harsh criticism from the future Saint Hippolytus and became part of the basis for a major schism in which Hippolytus would act as antipope after Zephyrinus' death. The teacher Theodotus the Tanner, formerly of Byzantium, had been excommunicated by Pope Victor, and his adherents formed an independent community at Rome. The group affirmed that Christ, though born of a virgin, was not the Incarnation of God from his birth, but received God's divine power at his baptism. The sect came to be led by a formerly orthodox Christian of substantial repute, Natalis, a confessor who had clung to his faith without wavering and had suffered torture. After a series of nightmares, Natalis became fearful of his salvation and determined to repent of his heresy. He reportedly put on penitential garment, covered himself with ashes, and threw himself with tears at the feet of Zephyrinus. He confessed his wrong-doing and begged to be received again into the communion of the Church. Zephrynus, following the precedent of his predecessors who held that lapsed Christians could be forgiven after due penance, eventually received him back into the fold (Eusebius, "Hist. eccl.," V, xxxii). Our most prolific source of information about Zephyrinus was his harshest critic, Hippolytus of Rome. A prolific writer, Hippolytus was the most important theologian among the Roman presbyters of this era. He was a strong adherent of the theology which taught that the Divine Logos, which became man in Christ, was a distinct person from God the Father. An opposing school of theological thought was represented at Rome by Cleomenes and particularly by Sabellius. These men themselves were strong opponents of the Theodotians, but they disagreed with Hippolytus in that they were not willing to acknowledge the Logos as a distinct person from the Father. They emphasized above all the absolute unity (monarchia) of God. They thus explained the Incarnation as a modality of the unified Godhead—a way in which God as a unity manifested himself—rather than being limited to the Son as a different "person" from the Father. Consequently they were called Modalists or Monarchians. Since the Christian populace held firmly to the unity of God and at the same time to the true Godhead of Christ, at first no distrust of this doctrine was felt among them. Moreover, Pope Zephyrinus himself did not speak out authoritatively in the dispute between the two schools, preferring to hope for Christian unity among the learned brethren in their theological speculations. Hippolytus, however, insisted that the pope should promulgate a definite doctrine affirming that the person of Christ is actually different from that of the Father and condemning the opposing view of the Monarchians. However, Zephyrinus would not consent to this. The result was that Hippolytus grew constantly more irritated and angry against he pope, and particularly against his deacon Callixtus, whom Hyppolytus blamed for the pope's inaction. Hippolytus went so far as to accuse the pope of favoring the heretics and further criticized Zephyrinus of subverting the discipline of the Church by receiving back into the Church sinners such as Natalis, who had been found guilty of grave spiritual offenses. Meanwhile, in 212, the persecution of Jews and Christians was lifted when Emperor Caracalla issued an edict which granted full citizenship for all free people of the Roman Empire regardless of their religion. While the situation of Christians vis a vis the state thus began to improve, Zephyrinus' papacy continued to be plagued by bitter internal strife until his death. Zephyrinus was buried in a separate sepulchral chamber over the cemetery of Calixtus on the Via Appia. Upon the death of the pope and the election of Callixtus, Hippolytus and a number of his fellow scholars formed a schismatic group that refused to accept Callixtus. For over ten years, Hippolytus stood at the head of a separate congregation and is sometimes considered the first antipope. This, however, is true only if one does not count Novatian, who had earlier formed a far more important schism, but was also declared to be a heretic, while Hippolytus was never condemned for heresy. Following the precedents set by his predecessor Cornelius I and Lucius I in the Novatianist controversy, Zephyrinus reportedly decreed that sinners who had been excommunicated for serious sins could be received back into the Church after completing a penance prescribed by Church officials. He also is said to have decreed that Holy Communion only be received by those aged 14 and older, a rule which remained unchanged until Pope Pius X (1903-1914) lowered it to seven years, which he called "the age of reason." The feast of Saint Zephyrinus, which was formerly held on August 26, is now celebrated on December 20, the day of his death. ↑ Martyrologium Romanum (Libreria Editrice Vaticana). This article incorporates text from the public domain Catholic Encyclopedia (1913). This page was last modified on 5 July 2013, at 15:20.